Mother's Day is tomorrow. Today I am reflecting on what a wonderful, strong and caring mother I have. She has always been there for me, supporting me in all my decisions, and guiding me in the right direction. I stumbled upon this poem that reminded me of my mother and thought I'd share with you. I'm sure many of you can relate to this poem. Now that I'm a mother too, I now 'get' just how special we daughter's must mean to our mothers. My mom with me, my sisters, my nieces and nephew. My mom playing with her granddaughters. 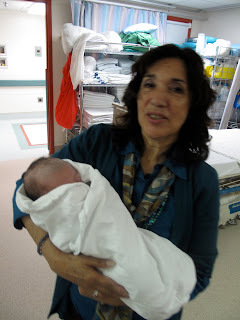 Proud Grandma with her latest grandchild, my son Benjamin. What does your mom mean to you? Feel free to share with us! Or share with us your favourite poem! Happy Mother's Day to you and your mothers!